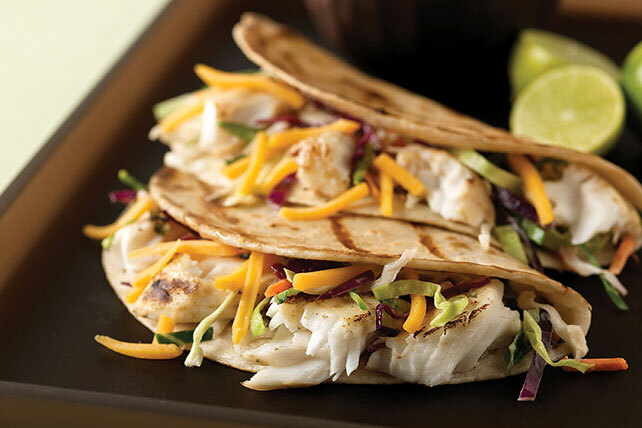 Discover this amazing recipe for Grilled Fish Tacos with Coleslaw for Two. These Grilled Fish Tacos with Coleslaw for Two are quick, cheesy and crunchy. This Healthy Living recipe is ready to enjoy in just 20 minutes. Mix 1 Tbsp. lime juice, dressing and cumin. Grill fish 4 min. on each side or until fish flakes easily with fork, brushing occasionally with dressing mixture. Meanwhile, grill tortillas 1 min. or just until warmed, turning after 30 sec. ; wrap in foil or towel to keep warm. Combine remaining lime juice, mayo and cilantro in medium bowl. Add coleslaw blend; toss to coat. Use fork to break fish into bite-size pieces. Top tortillas with coleslaw, fish and cheese; roll up.